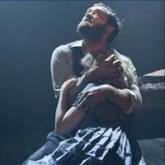 Critics have saluted Jude Law's latest appearance on the West End stage, with one national reviewer calling it "the best performance I've seen him give". The Guardian's Michael Billington says the actor is "excellent" in the Donmar Warehouse's "outstanding" revival of Eugene O'Neill's Anna Christie. The Telegraph's Charles Spencer says he "discovers humour [and] tenderness" in his role as a burly Irish docker. The Independent's reviewer, meanwhile, applauds his "muscle-bound torso". First staged in 1921, O'Neill's play about a former prostitute reuniting with her sailor father won the Pulitzer Prize for drama the following year. It was famously filmed in 1930 with Swedish star Greta Garbo, while Natasha Richardson appeared in a celebrated New York production in 1993 alongside her future husband Liam Neeson. Ruth Wilson plays Anna in Rob Ashford's new production, a role to which she brings "both toughness and vulnerability" in Spencer's eyes. "There is an emotional rawness here that is often painful to watch, but not a trace of sentimentality in her acting," the Telegraph's critic continues. According to the Independent's Paul Taylor, the 29-year-old - previously seen in BBC crime drama Luther - is "magnificent in every department". The "splendid" David Hayman is also praised for his portrayal of her Swedish father, "a scrawny mass of defensive guilt and pathetically belated pride". Charles Spencer also found Hayman "superb", though he expresses reservations about his character's "somewhat overdone Swedish English". He also suggests Law's Irish speech patterns "often sound like a wicked parody of JM Synge" and that the 38-year-old resembles "the bearded old salt on packets of Player's Navy Cut". Anna Christie has also drawn praise from the Evening Standard's Henry Hitchings, who suggests the "visceral toughness" Law exudes "may just shape an entirely new career path for him". Ashford's "deft" and "classy" production, he continues, is "likely to haunt those who see it for a long time". Wilson previously appeared at the Donmar alongside Rachel Weisz in A Streetcar Named Desire, a role for which she won an Olivier award. Law, meanwhile, played the title role in a 2009 Donmar production of Hamlet, presented at the larger Wyndham's theatre. Anna Christie forms part of Michael Grandage's farewell season at the Donmar after nine years as its artistic director. The intimate studio theatre will host a revival of John Osborne's Inadmissible Evidence after it finishes its run on 8 October.